The NBA’s Stats API provides data for every single shot attempted during an NBA game since 1996, including location coordinates on the court. I built a tool called BallR, using R’s Shiny framework, to explore NBA shot data at the player-level. BallR lets you select a player and season, then creates a customizable chart that shows shot patterns across the court. Additionally, it calculates aggregate statistics like field goal percentage and points per shot attempt, and compares the selected player to league averages at different areas of the court. Update April 2017: for some reason the NBA Stats API is not working with my hosted version of the app. The app still works if you run it locally, see instructions below. BallR lets you choose from 3 primary chart types: hexagonal, scatter, and heat map. You can toggle between them using the radio buttons in the app’s sidebar. 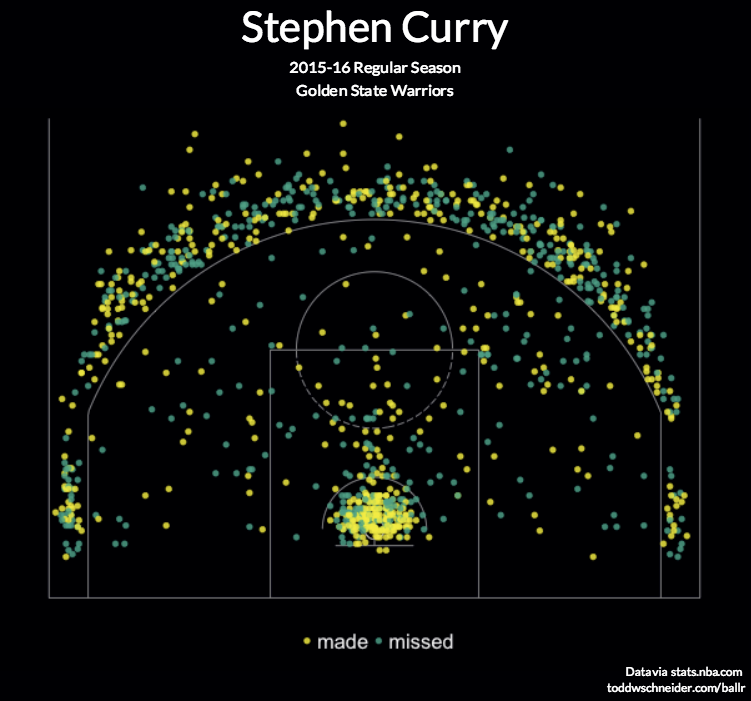 The chart confirms the obvious: Stephen Curry is a great shooter. His 3-point field goal percentage is more than 11 percentage points above the league average, and he also scores more efficiently than average when closer to the basket. Kobe’s shot chart shows that he’s shooting below the league average from most areas of the court, especially 3-point range (Kobe’s 2005–06 shot chart, on the other hand, looks much nicer). Heat maps use two-dimensional kernel density estimation to show the distribution of a player’s shot attempts across the court. The BallR app doesn’t currently have a good way to do these historical analyses on-demand, so I had to write additional R scripts, but a potential future improvement might be to create a backend that caches the shot data and exposes additional endpoints that aggregate data across seasons, teams, or maybe even the whole league. You might even be right, but shot charts definitely don’t prove it. Passing or dribbling the ball into the restricted area probably increases the risk of a turnover, and that risk might more than offset the increase in field goal percentage compared to a longer shot, though we don’t know that based on shot charts alone. Next-best options at the time of the shot: was another player open for a higher value shot? I’d imagine that NBA analysts try to quantify all of these factors and more when analyzing decision-making, and the NBA Stats API probably even provides some helpful data at various other undocumented endpoints. It could make for another area of future improvement to incorporate whatever additional data exists into the charts. The BallR code is all open-source, if you’d like to contribute or just take a closer look, head over to the GitHub repo. Posts by Savvas Tjortjoglou and Eduardo Maia about making NBA shot charts in Python and R, respectively, served as useful resources. Many of Kirk Goldsberry’s charts on Grantland also served as inspiration.